This uncirculated real-photo Italian vintage postcard features arguably the most famous star and lasting icon of the silent film era Rudolph Valentino. In this card he is seen alongside his co-star Helen D'Algy in a scene from A Sainted Devil (or Notte Nuziale as the film was titled in Italy). Based on the novella Rope's End by Rex Beach and directed by Joseph Henabery this was Valentino's 29th movie and his final Paramount picture. He would make only three more films before dying prematurely two years later at 31. Whilst A Sainted Devil was first released in the USA in 1924 it wasn't distributed in Italy until after the actor's death which would date this postcard to approximately 1926. It was printed by the Florence postcard company Ballerini & Frattini, who opened their doors in 1912 and are still making postcards today. 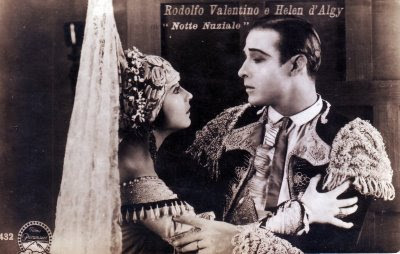 A Silent Devil is considered to be one of Valentino's lost films.